Antibiotic resistance is a growing problem in the health care community and is a serious threat to community health (Centers for Disease Control and Prevention [CDC], 2013). The demand for a quick fix for infections has led to a consumer driven prescribing (Bartlett, Gilbert, & Spellberg, 2013). Health care providers are giving in to patient’s desires rather than prescribing using the available evidence and necessity of the antibiotic. Two million people a year develop antibiotic resistant infections and 23,000 die as a result of the resistant infection (CDC, 2013). 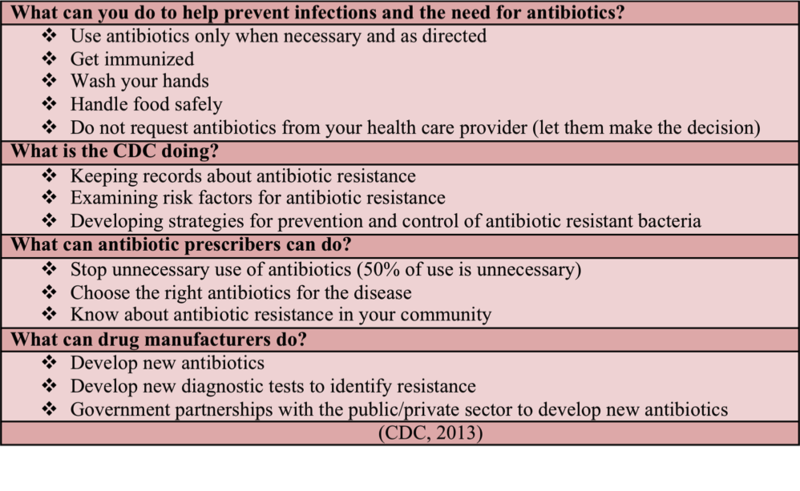 Everyone needs to have an awareness of how to prevent antibiotic resistance and the seriousness of the problem. There are several ways everyone can contribute to getting smart about antibiotics. Bartlett, J. G., Gilbert, D. N., & Spellberg, B. (2013). Seven ways to preserve the miracle of antibiotics. Clinical Infectious Diseases, 56(10), 1445-1450. Christine Heady MSN, RN, FNP-BC is currently working on a PhD in Health Studies at TWU with a focus on higher education. She received her Master of Science in Nursing from Abilene Christian University in 2001. Christine currently works for Texas Tech University Health Science Center in Colorado City, Texas as a nurse practitioner and primary health care provider for the Wallace and Ware Unit. Like this post? Be sure to share it! You can also follow us on Facebook!